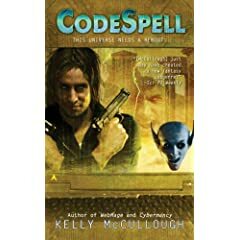 I read the first two books in this series, and I really enjoyed them. I'm a big Greek mythology buff, and I really liked the take on these myths in Webmage and Cybermancy. I have a history of technophobia, but the technospeak didn't take too long to get used to. . .though I have to say, I have a new laptop computer (her name is Hypatia) and I'm still waiting for her to turn into a goblin. Hasn't happened yet, but I've got my fingers crossed! Anyway, for those looking for an original take on the urban fantasy genre, I highly recommend this series! My (currently comatose) computer is named Natalie T. Steppenwolf. The T stands for Turbo. Long story. Kimberly, I have to admit I've had no luck in the webgoblin department either--still just Melchior and Shara at second hand. The third book is already out and is fantastic! I blazed through this series by one book a day! Its like he created a whole new genre by combining fantasy and sci-fi. As childish as this may sound, I hope this series never ends. I'm going to have a really hard time buying the last book, because i don't want the story to end. kelly- if you ever read this, you may want to reconsider designing your author website. Include more information in it about what you're up to and stuff so i don't have to keep searching for interviews to find it out!